Sterling silver, Turquoise, Picture Rock, Tiger Eye, Magenta Turquoise, Oyster Shell, Black Jade, Opal, Yellow and White Mother of Pearl. 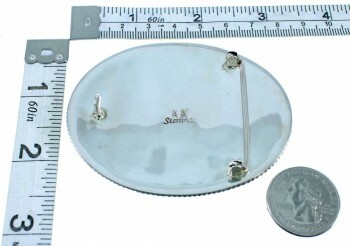 Belt buckle measures approximately 2-1/4" long, 3-1/8" wide, and will fit a belt that is up to 1-1/4" wide. 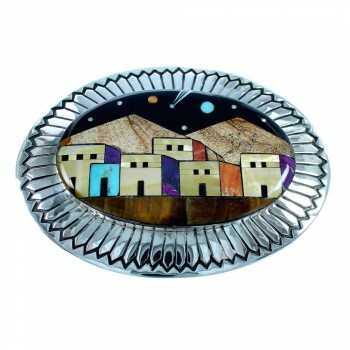 This belt buckle is a true piece of Southwest artistry! This belt buckle is a gorgeous piece of jewelry that is hand crafted out of genuine sterling silver and Multicolor inlay. The inlay consists of: real Turquoise, Picture Rock, Tiger Eye, Magenta Turquoise, Oyster Shell, Black Jade, Yellow and White Mother Of Pearl along with man made Opal. The inlay is delicately set, while creating a stunning Native American Pueblo or Village Design. A beautiful starry sky, along with a village and desert mountains beneath are shown in this magnificent scene. The detail in this piece is absolutely captivating and will draw plenty of compliments! An imprinted design surrounds the inlay and completes the piece beautifully. Belt buckle is stamped sterling and hallmarked.